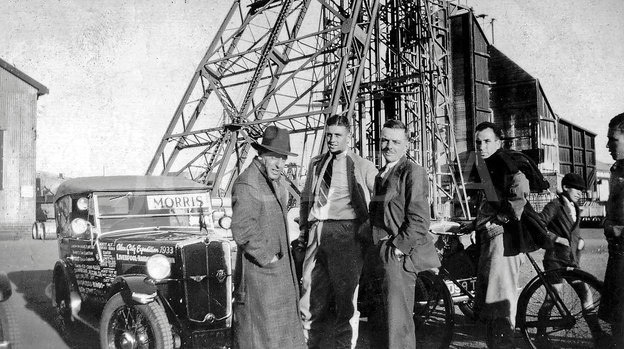 Intrepid Minorist’s are not a new breed and back in January 1933 Alan Gilg and Walter Kay set out to travel from Liverpool to Capetown in a 1933 Minor Tourer HF 8547. Their adventures are recorded in a book first published by the RAC in 1981 entitled ‘Turn Left- The Riffs Have Risen’ (ISBN 0 86211 016 5). The book was authored by Gilg and has been long out of print but for those who have not read it as yet , copies can be found on Amazon and eBay. The image seen here was discovered on a South African stock image site without a caption and it looks as if the car is about to embark on a voyage – perhaps from Folkstone on the outward leg to France or in South Africa prior to shipment of the vehicle back to the UK. Kay is seen in the centre of this photo with Gilg to his left sporting a moustache.